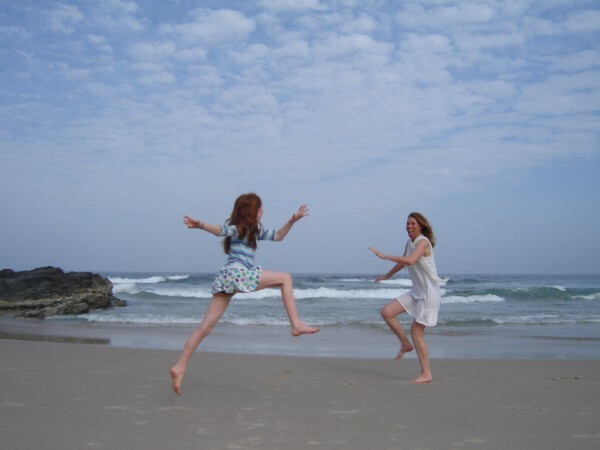 This photo above is of my daughter and I are dancing on the Sand in Brunswick Heads. It’s a sacred moment. We are feeling the joy of being connected to earth, sky, sea and each other. I want more sacredness in her life. I want a culture and community that honours her journey as a young woman, and the journey of all women, all men and all life. I want the earth to be honoured, but at this moment of descent I am feeling the loss of life, of so much life, and the dishonouring of the sacred. And so I look to other ways of knowing and being. The Autumn Equinox is said to be the time when Persephone made her descent into the underworld. In the oldest versions of this story (pre Olympian myths) she willingly went there. (1) She went because she heard the call of the dead. She heard their pain and confusion. And this story is a seed for us, a kernel of truth. At this point in the cycle we too must descend, must return to the darkness and tend to those neglected parts of ourselves. It is a difficult journey for we might come face to face with uncomfortable truths, with feelings of loss and grief. 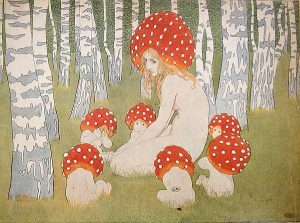 But like Persephone if we willingly go there, if we pay attention and listen with compassion to those parts of ourselves, then we may become Queen of the Underworld. We may learn how to navigate this difficult terrain, so that this becomes a place of birth too. This dark place is a place where death becomes life. This is the great teachings of the Elusian Mysteries ( Ἐλευσίνια Μυστήρια) surrounding Demeter and Persephone…And of course there is much here too on the mother and daughter relationship but that is for another time. There story is a story of the wisdom of the cycles. 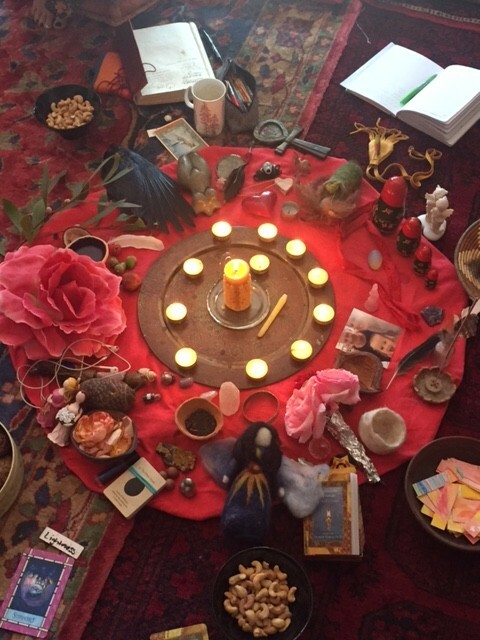 I was blessed to hold space for a glad of women who come together to remember the wisdom of the cycles, to reflect on the ways in which we actually live this wisdom through our menstrual cycle, and throughout our lives. It is a reminder of how intimately linked with are with the earth and her days, her seasons, and her movement with the moon around the sun. Blessed work indeed, powerful remembering of our sacredness and our deep interconnection. Happy to chat further about this work, and the way it ripples out into the community, seeding change. Bookings for my Saturday 3 June workshop can be found here. 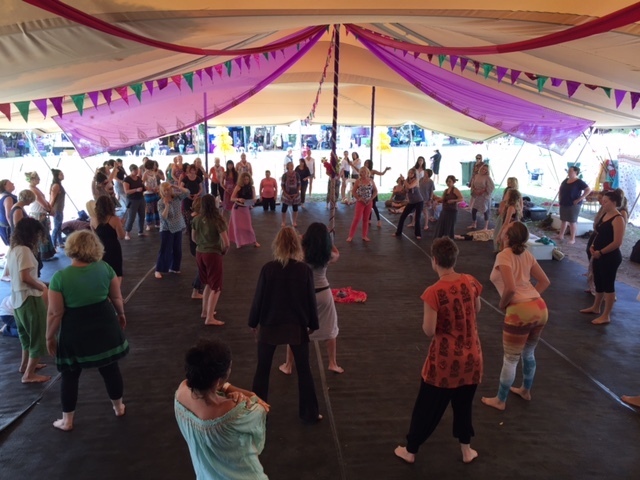 I was blessed to hold space on Feminine Embodiment with Sonia Stocco at the most recent Seven Sisters Festival. Our session explored how we might embody our truth, and be with what is arising within us. (Just what I needed!) We noticed our feelings through our sensual experience of them, trusting that our bodies “speak” our deepest truths, and trusting our capacity to be with these truths. We also explored how we might communicate these feelings verbally and non verbally. And how these processes give rise to a deeper more intimate connection not only to our bodies but the good ground of our being, and with Life itself.Sonia brought her wisdom as a compassionate communication facilitator (based on Non Violent Communication) and massage therapist. It was a beautiful opening to presence for us and the participants who attended. We felt, moved, touched and danced. This photo shows some women engaged in the Shakti Awakening Dance practice, a process I learnt through a Lalita Devi Immersion with Chameli Ardagh. We will be exploring this process more deeply in the upcoming Autumn Equinox Dance.For me dancing these seasonal sabbats is an important way of honouring my ancestry and the earth. It is a way of listening to the songs of the earth, and dancing to and for her. At these moments we can pause to reflect on the cycles of the earth and our own deep cycles held in and of the earth. It is a sacred connection, a weaving of ourselves back into cyclical time. Hopefully it is for you a space to commune with the sacred within you, within the group and out into the wider community of the whole earth.Due to illness I called off my last seasonal dance, so I haven’t held one since last spring. I am very excited to hold this space for the season of Autumn, or Marameet (in the Boonwurrung language) and this particular moment of balance between light and dark, between activity and rest, between the harvest and the loss…It is an invitation to honour both before we spiral into increasing darkness, and all that this entails. I trust some of you will feel called to join us in this exploration of your moving body in a safe and sacred space. 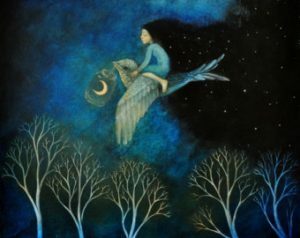 Yesterday I woke early and went out into the dark morning, where the waning moon was still the brightest orb in the sky. She was in the west and on her way down. I listened to a beautiful “Open Sky” Meditation by Tara Brach, an invitation to listen with all of the body, and connect to the presence in everything. Afterwards I set my intentions for the day, ‘to feel the spaciousness of my awareness and to be enlarged by all that I encounter.” And I felt the sky responded to my intention setting with the beauty of changing light, from yellow, pink to purple and after a smattering of rain, a delightful double rainbow. Its not so hard to feel spacious when the world speaks in such colour and movement. But I do not always feel so open and expansive and sometimes I shut down my body. I still can close myself off from the ground of my being and from the earth too. There are times when I am closed in fear, when I run as far as I can from this discomfort. But on a personal level I am being called to open more fully to all that is arising, to allow the feelings, and to be OK with them all. As parents we need to model our self acceptance, we cannot fake it. Persephone whispers of this need for truth and authenticity. And I see this call in my children too. And so I create spaces in which to deepen my connection and awareness. The work I do out in the world is as much for me as for you! And that seems OK too. This is the beauty of it. Pretty excited to be hosting another Make Your Own Medicine Drum Workshop with Bec Grace Funk of Priestess Your Life. The drum is a sacred tool, an instrument of music, an intimate partner in the soul’s journey and woven through time with women’s spirituality. In many ways it is a journey into the dark and out again, as we reflect on our own birth and the way this impacts upon our lives and our creative processes. It can be an invitation to become Queen of our own underworld, of being with the grief, and loss we may have encountered at our birth…and with all that was birthed with us. 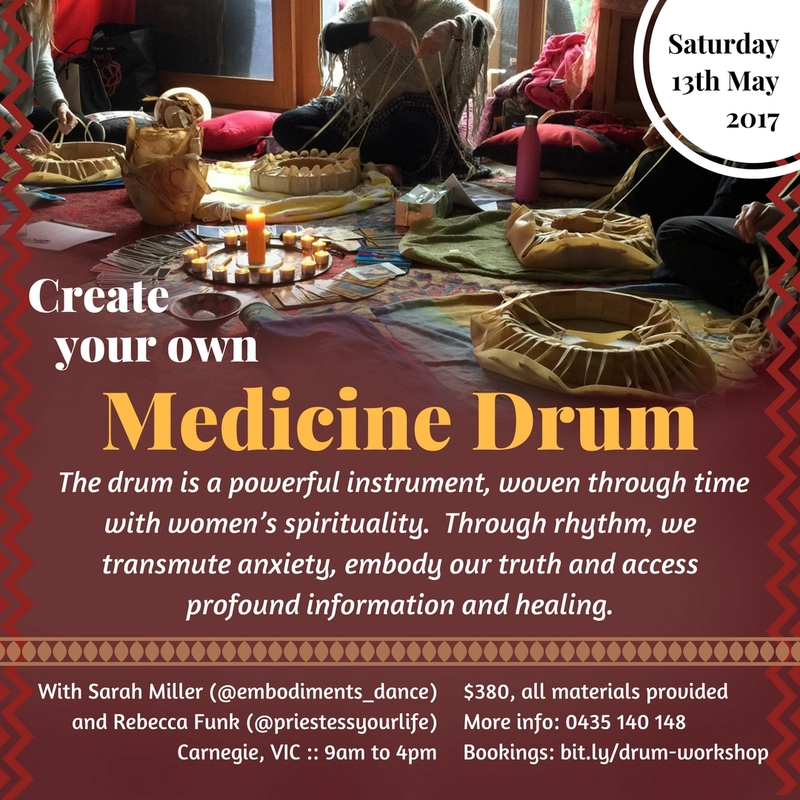 Creating a medicine drum is a powerful process providing women with the opportunity to revisit your birth as you birth your drum through a creative shamanic practice. We only have a couple of spots left for this workshop so please get in quick if you are interested. In these times we need to come together, to find community, to build communion. What communities support and sustain you as you journey through this life? 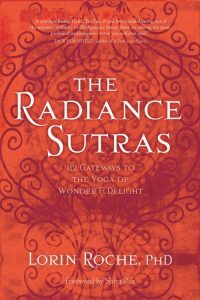 Where can you go for the deep nourishment of compassion and acceptance? Where do you go to build your heart muscle and to learn the art of listening, of allowing? Where do you find the sacred container of stories, of song, of earth? Much of this comes to me via the School of Shamanic Womancraft, my dear friendships with the beautiful people in my life, my family and in the places I hold sacred in my heart. Several years ago I met two amazing women from the Earth Song community (not the witch camp!) and I really treasure the work that they and this community do. 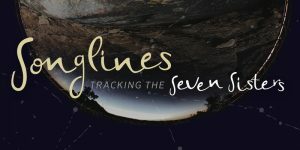 These lovely people have been holding space for many years now as a centre for ecology and spirituality, weaving these elements together….They host many wonderful talks, reflections, walks and many other offerings. I am hoping to make it to one of the Earth Song walking sessions where you are invited to walk mindfully and to Listen to the Earth. 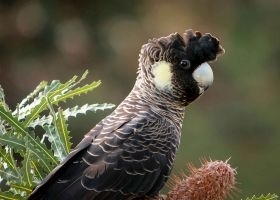 The next one, is on April 12, The Two Bays Walk in Dromana. I encourage you to check out their bountiful offerings. To walk mindfully is a practice we can do at any time, with each step we take. Thich Nhat Hanh offers this advice….”If you have not arrived fully, 100 percent in the here and now, don’t take the next step.” (2) Hmm how to pause mid step, to rest comfortably until we come back to here and now? 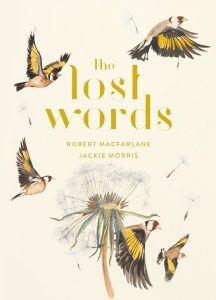 If we can step on this earth mindfully, if we can remember the abundance and generosity of the earth , we are coming some way towards that Aboriginal concept that, “everything come up out of (the) ground- language, people, emu, kangaroo, grass. That’s Law” (3) This understanding of our utter interdependence upon this good ground seems to offer us as a way through the demise of current thinking/being. But we need to listen to the stories, really listen and understand the intimate knowledge embedded in them. We need to recognise and celebrate Indigenous Knowing, the wisdom in the land and walk together engaging with Country, with place and each other.